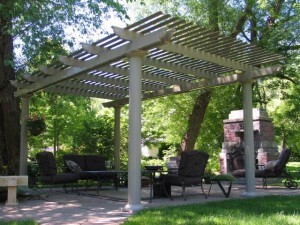 Are you in search of the perfect pergola for your property in Des Moines, Iowa? If so, turn to the experts at U.S. Patio Systems and Home Remodeling. We sell and install aesthetically pleasing and exceptionally well-made pergolas that transform underutilized backyards into beautiful outdoor living spaces. Stylish appearance – You’ll have the ability to choose from a number of different gorgeous pergola styles to ensure you find the perfect design to complement your home. Ease of maintenance– Our pergolas have an electrostatic finish that makes them exceptionally easy to clean. Durability – All of our pergolas are made of heavy-duty extruded aluminum, so you can expect your new shade solution to be long-lasting. To learn more about adding a pergola to your home, contact U.S. Patio Systems and Home Remodeling today. Our specialists are available to answer any questions you have and can tell you more about all of the exceptional products and services we offer to homeowners in the Des Moines, Iowa, area.